had told me that in Louisiana you could get Daiquiris at a drive-through window. I didn’t believe it at first, but sho-nuf…. 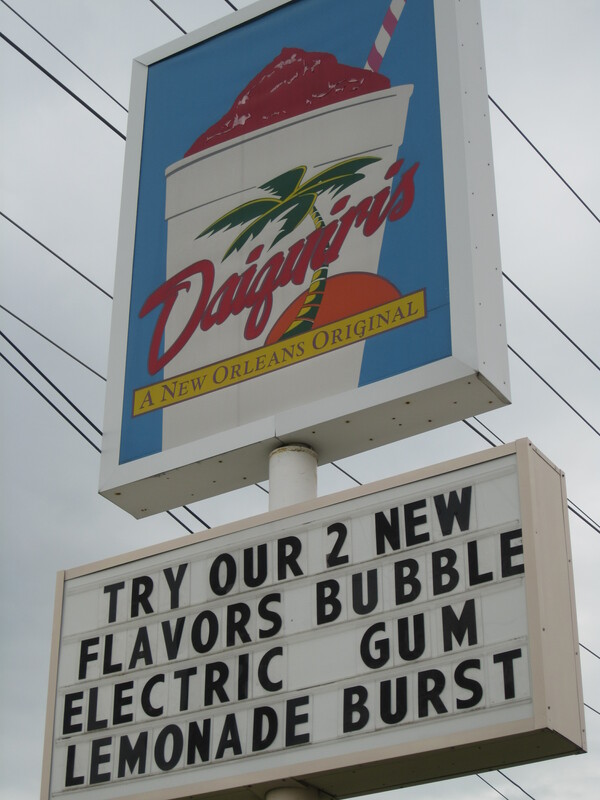 in the middle of the Bible-Belt, where in some counties you can’t buy wine or liquor on Sunday Mornings between 10:00 and Noon, you can go through a drive-through and order yourself a Bubble-Gum Daiquiri. It’s a loop hole in the state law. You can have booze in your car as long as it’s in a sealed container. The store can sell it to you as long as the straw is not in the lid. What you do after that is up to you. There was one on our way to the Rental Car drop off, so we just had to check it out. Steve, being the information gatherer that he is had to go inside to ask questions. We met a nice guy named Eric with a big smile. He answered all of Steve’s questions and let us try different flavors. They were all in brightly colored swirling slush machines behind him. I chose the “House Special” which is a blend of their three most popular flavors. But of course we just had to go back to the car to buy it. We followed the three-step process that Eric explained. See Kim? I just love being right….These places are all over the state. In our parish (not county. we don’t have them. leftover from napoleonic law back before Louisiana belonged to the U.S.) we can’t buy liquor on Sundays at any time. Or on Mondays or Tuesdays or Wednesdays……you guessed it. We’re dry. However, take a jaunt across the Red River into Alexandria and there are 3 drive thru daiquiri places. Gosh! Who woulda thunk it? dang! I love it when you are right! and that Eric is a doll . . . I thought Eric was a doll too. I can see someone doing a whole thesis on the psychology involved in this whole thing. And the dry parishes and the different religious attitudes and cultures in the state, etc. etc. etc. Very fun. Well color me wrong! I thought drive through liquor stores were bad/crazy enough. Don’t you just love the South?! Well… actually I do. They know how to get things done. So check this out: You can get a frozen concoction while you’re getting your oil changed. That’s it! I’m a gonna fly south for the winter! Rub it in Fawn, Being right may not last!